23 wide x 40 tall on thin wood..
sort of happy then but gee it just doesnt last, the happiness thing. i knew Alex passingly, once i painted him and his girlfriend from Detroit, while they waited, it came out ok.
once in a studio he wrote out my numerology info for me. it was more involved than i really could talk about to him. once at my decrepit midtown house he was over and we bonded because we discovered we could both quote from The Chism Trail, an 1800’s western poem/bunch of dirty limericks , i think we had both read the same library book, we laughed pretty hard. remember library books..? we never jammed or stuff. once somebody gave me a piano and i had it delivered to the same decrepit house and he played it a long time one night, i just sat there, although i had a bunch of guitars. i couldn’t tell what he was playing. we never did much really talk, i guess that was normal. i saw Big Star play only one time in the 70’s , at the Overton Park Shell. the sound really sucked. he just he sang, there wasn’t any harmony, that i could hear. the only band that overcame the horrible sound at The Shell was Deep Purple. they were so loud that they killed several small dogs and an elephant at the nearby zoo had a miscarriage.,.man, they figured out how to play that venue..! he got me to smoking American Spirit cigarettes. they were awful strong. i guess if you were around him often enough then you would meet the very impolite version of Alex but i never did. he was really under-rated as a guitarist. i like that album he made called Set. Pat’s Pizza on Summer Ave in Memphis, if you were never there then there’s no way to describe it to you. it cant be described. 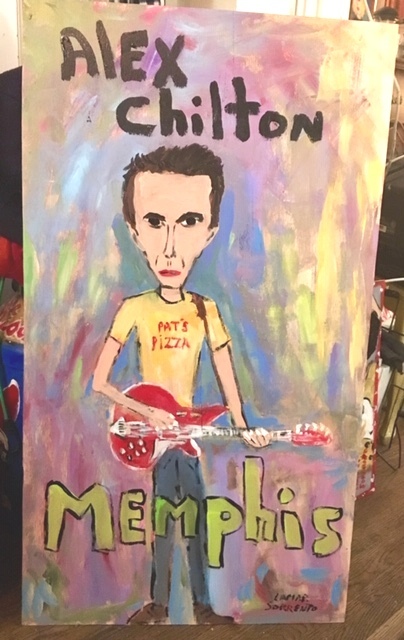 Alex was sort of the Pat’s Pizza of Memphis music.